Odie's Food Musings: Thoughts on..."Floyd in the Soup"
Thoughts on..."Floyd in the Soup"
I was at home one afternoon on one of the (very!) rare sunny days of the Irish summer and realised that it was far too nice a day to be stuck inside tapping away on my laptop. I don't know what it is about summer and sunshine but I find a new kind of enthusiasm for reading. I'd looked through my books in my room and was left very uninspired (I must buy some new books soon) but while heading to the sitting room to look through the floor to ceiling wall of books that belong to my dad, I passed by the cookery book section in the kitchen and this lovely little gem caught my eye! 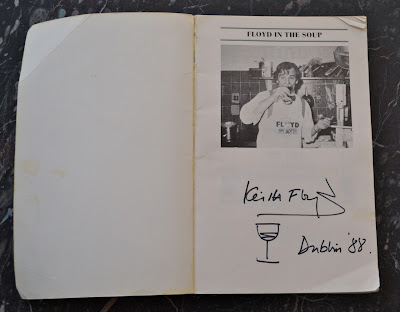 I've mentioned before in a previous post one of my favourite tv chefs is Keith Floyd, so I was delighted to find this very kitsch and cute book recounting his travels from full time restauranteur to one of Britain's best loved tv chefs. It's a lovely easy summery read, I read it in that afternoon at the garden table with the dog at my feet. In between tales of fame and misfortune he dishes out classic Floydian recipes fashionable during the 80's and seen as retro now. On numerous occasions it made me giggle out loud and reaffirmed my love for his genius in the kitchen combined with his razor sharp wit washed down with a good schlurp of red wine! My love of food spilling off my plate and on to this blog.